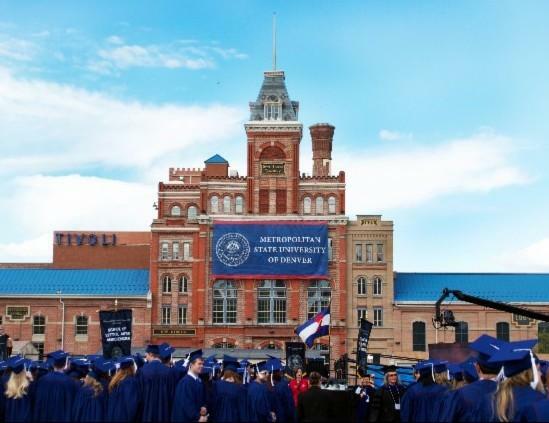 As Metropolitan State University of Denver finishes its celebration of 50 years, President of the urban campus Stephen Jordan says he's learned one lesson from the students about to graduate: persistence. An interview with Jordan aired on KUVO's morning show, "First Take with Lando and Chavis." Jordan ticks off the profile of the classic MSU-Denver non-traditional student. "About 60 percent of the students at this university are either first-generation, a student of color, or low income. Ninety-seven percent of the kids at this university are Coloradans." And, of course, they're not all kids, Jordan acknowledges. "The average age is 26, and at every commencement we'll have someone in their 70s getting a degree." The school's mascot became the roadrunner, acknowledging the students that had to dodge traffic on Speer to get to class, but Jordan says he sees that kind of hustle daily in the lives of the non-traditional MSU-Denver students. Jordan's closing charge to the graduates at this weekend's commencement: "Know that no one is silent, though many are not heard. Work to change it." Music on the audio feature below performed by the MSU-Denver Jazz Combo, directed by Ron Miles, recorded in 2013 at KUVO Studios. Metropolitan State University of Denver launches the Denver Project for Humanistic Inquiry (“D-phi”) in September with a citywide series of events including art exhibits, film screenings, theatrical performances and lectures. D-phi Director and MSU—Denver Associate Professor of Philosophy Adam Graves shared the big, esoteric picture on "First Take with Lando and Chavis."